I usually give Twitter hashtag campaigns a particularly wide berth but one which caught my eye yesterday was #3albumsthatchangedmylife. Whilst I have long been a music lover and especially so in my teenage years (who wasn’t/isn’t?) I cannot say that any one album or artist changed my life to the degree some may have you believe. What I can admit to though is there have been seminal albums in my life and ones which have, in retrospect, gone some way in explaining my eclectic tastes. It’s an interesting exercise, could you narrow it down to three? I suppose if the criteria is as strict as ‘life changing’ then it ought to be relatively easy, if not then you are very fortunate to have enjoyed so many seismic musical moments in your life. So last night I came up with my three choices, they are all on old vinyl copies and all come with a considerable chunk of memories of varying kinds. For me the criteria should encompass all that an album does to the listener overall. That is to say how it plays a part in creating memories and not just an audio experience quite like no other. My choices helped create friendships, prompt unforgettable concerts, encourage (and discourage) my teenage guitar playing years and inspire me to search other musical and artistic avenues. 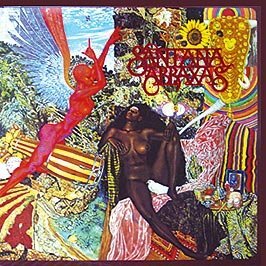 First up is the album featured in the header photo; Abraxas by Santana. A five times platinum selling album in the US alone, it will be forever associated with the classic version of Black Magic Woman. But that wasn’t the reason I bought it, that came through hearing Carlos Santana on a radio programme in the very early eighties called Guitar Greats and I was immediately taken with Santana’s laid back Mexican dialect and how he was influenced by both the blues and Indian spiritualism. The short musical excerpts contained guitar licks like nothing I had heard before, beautifully melodic and full of expression. The album was music like nothing I had heard before, a theme which runs through all of my choices. In the cold, wintery nights of an English east coast town this music seemed so exotic, the album artwork, like the music was full of colour and the promise of new experiences. More than thirty years later I am still playing my Santana vinyl, I still have my SG guitar bought simply because Carlos (then) played an SG and I was desperate to get that sound and more especially, that vibrato. Like my other choices, Santana took me on a musical path so utterly different from those which my friends followed and would prove the catalyst for becoming detached from much of the mainstream, searching instead for new beginnings and off shoots in all aspects of my life. Second, in no particular order is My Goal’s Beyond by the jazz-rock guitarist John McLaughlin. I have covered the standout track Goodbye Pork Pie Hat here for those more specifically interested. McLaughlin burst through my radio airwaves on the aforementioned Santana programme when Carlos talked about his foray into jazz with McLaughlin on the album Love, Devotion and Surrender, a veritable musical blitzkrieg of an homage to John Coltrane. McLaughlin embodied all that I wished I could be; intelligent, an incredible guitar player and a unique individual. A softly spoken, intensely spiritual and gracious man who took jazz guitar to a new level. With his band The Mahavishnu Orchestra he set the jazz world alight with brilliant musicianship and a blend of music which blended jazz, blues, funk and Indian traditions. Their seminal album The Inner Mounting Flame was recorded in one day, such was the band’s ability. So McLaughlin took me on another journey, I was introduced to jazz, acoustic Classical and Spanish guitar playing, jazz-funk and jazz-rock including the genre’s greats such as Stanley Clarke, Weather Report, Larry Coryell, Miles Davis and Shakti. This album is dark, moody and retrospective, it was an acoustic interlude in-between the frenzy of his electronic soloing with Mahavishnu and his other solo albums. It was the promise of things to come. Last but actually first in terms of when I bought these comes the triple live album Yessongs by the kings of progressive rock, Yes. I bought this when I was thirteen and on holiday abroad. I blew virtually all of my holiday pocket money solely on the basis of the amazing artwork by Roger Dean. I was mesmerised by the album cover and figured the music must be a fair match, I was right. I remember trying to play it on my Grandfather’s old record player, despite the horrific sound quality I could hear enough to completely draw me in and could not wait to get home and discover it properly. To put it in context, I was in my first year of secondary school and the charts were dominated by everyone but Yes. Imagine going to school and telling your friends who were listening to The Specials, The Jam, The Police, Blondie, Bowie, Dexys and Adam and the Ants about a twenty five minute keyboard solo? I was on my own until I met a future lifelong friend who went with me to see them in 1984 at the Birmingham NEC. This album represents countless school nights with my best friend pouring over the album covers and lyric sheets, wishing we were guitarist Steve Howe and embracing once again, the notion that I wasn’t, and never would, fall in with the proverbial pack. I love the music and the artists but above all I love the memories associated with each of them. I didn’t like them just to be different because I was too shy in that regard. I never liked to stand out but at the same time I hated ‘standing in’. I was the one always on the edge of the group photo, never in the middle. I never felt the need to share my diverse interests with anyone because that would have spoilt my ‘escape’. I was on the cusp of discovering a whole new world and these three albums were the soundtrack to that period of glorious discovery.